For some, day centres for older people may conjure up images of incessant bingo and unstimulated people sitting around the edges of a dull room in an isolated building away from the community. This was not my experience during the 56 days I spent at four day centres for older people in 2015-16. These visits were for a study which aimed to improve the understanding of the purpose and role of English generalist day centres for older people by painting a rich and contemporary picture of them. I was investigating what they offer, who uses them, why and how, what they contribute to the lives of those involved with them, how they are perceived and how they relate to health and social care services. What are day centres, anyway? Day centres are services based in a building. They may differ in what they offer, their target users, admission criteria, ownership, size, building used and the ways they are funded. Their similarity lies in their provision of care and/or health-related services and/or activities specifically for older people who are disabled and/or in need, in a building which people can attend for a whole day or part of a day. For more than a decade, very little research has been published about day centres in England. Their relevance has been challenged within today’s policy environment of personalisation, marketised services and reduced public funding for social care, and centres commonly being closed or decommissioned despite some older people expressing a wish to access them. So, are traditional, non-specialist day centres for older people an outdated service model? The findings of a study undertaken in 2014-17 at King’s College London and funded by The Dunhill Medical Trust’s Older People’s Care Improvement Initiative, suggests they are not. 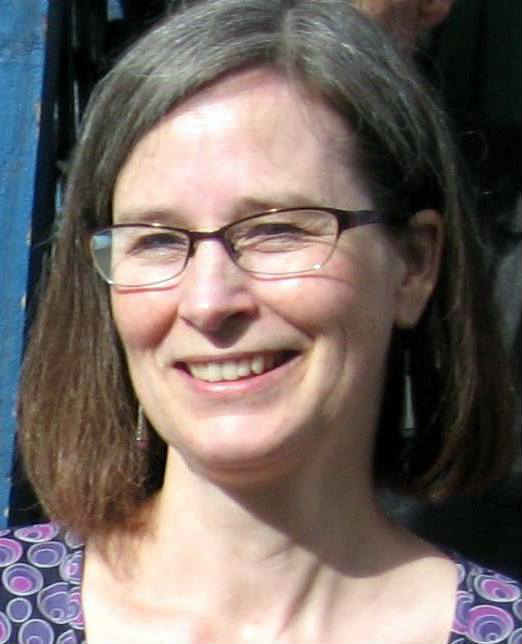 As well as noting how day centres and their attenders differed, despite sharing characteristics, the study found that day centres enriched the lives of socially isolated people who were unable to go out without support, offered added value and resulted in outcomes relevant to current social care and health policy themes. It also identified the potential for their development and optimisation to improve older people’s health and wellbeing, to support carers and to maximise the impact of health and social care services. The study’s findings, their relevance and implications for commissioners are summarised in a new evidence briefing. The research, about the role and purpose of non-specialist day centres for older people, investigated what four day centres offered, who used them and how, their experiences, what centres contributed to the lives of those involved in them, the day centres’ relationships with community, primary and secondary care services and perceptions of day centres’ role and purpose. 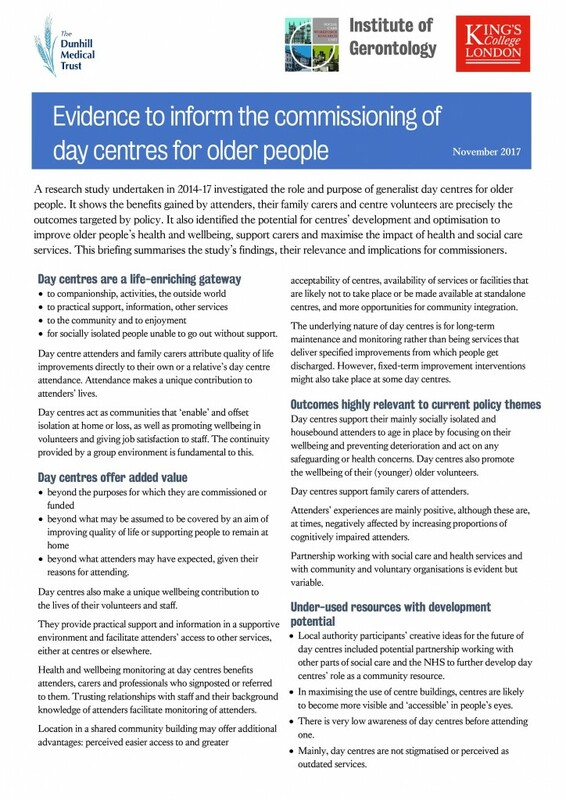 Its findings are based on data collected during regular visits to four day centres (totalling 56 days) and interviews with 69 people involved with them: older day centre attenders (23), family carers (10), day centre staff, volunteers and managers (23) and local authority social care staff (13). Outcomes for attenders and carers were reported in interviews and measured with a validated tool, the Adult Social Care Outcomes Toolkit (ASCOT). Further information is available on request. Please contact: Katharine.e.orellana@kcl.ac.uk. Katharine Orellana is a Research Assistant at the Social Care Workforce Research Unit in the Policy Institute at King’s. This entry was posted in Older people and tagged Katharine Orellana by . Bookmark the permalink.